Okay, so I know I moved on to the track last week, but I had friends this week. It was the first ever session for two of them and one of them hadn't been in a while so they were staying in the newbie area and I decided to stay with them. I looked over at the track occasionally at the beginning, thinking I'd made the wrong decision. But I then saw that they were doing 25 in 5 in pairs, walking on toe-stops, running starts on toe stops, running starts on wheels, jumps, it all looked terrifying! And the fact that they had to stop before they ran into us was proof that I shouldn't have been over there - I can't stop yet! I was also grateful for being back in the newbie group as I could spend longer on the basics I hadn't cracked yet - left knee taps, sticky feet, stops, crossovers. While practicing crossovers, I found that I could do one footed sticky feet, which made going round corners so much easier! I used to hate going round corners! 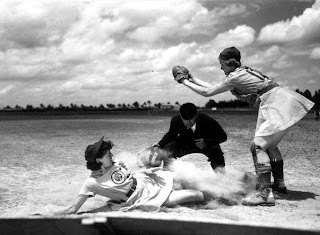 Another reason that the newbie group was good was that we were taught something we don't really need to know with the new WFTDA rule set - baseball slides! They're no longer being taught as people were using them to stop, enter the penalty box, etc. which I imagine got quite hazardous with your leg sticking out like that! However, we were told that they come in useful if you find yourself falling towards a wall - think "face" or "foot", which would you rather break? But this exclusion from the minimum skills made this skill feel rebellious, like we had a substitute teacher who was letting us do Art all day instead of Maths. This fun was then rapidly over when we had to do grueling laps of sticky feet in derby stance. My sticky feet has got a million times better from it and my stance has improved but, I swear, my thighs felt like they were bleeding at one point. Derby stance thoroughly improves your skating, but it hurts like a sunofabitch at the beginning! I very very glad when then cool down and stretching came next! Oh! And for this whole session I got to break in my new knee pads! Yay! Now, if you excuse me, I'm off for my first mid-week skate with one of my derby friends. In this heat?! Yes, I know. We must be mad!